Due to a bug in Bitcoin testnet's difficulty adjustment algorithm, blocks are coming at an incredibly rapid (>100x expected) rate currently. These extreme conditions may make PoP mining difficult. Bitcoin testnet will self-heal automatically, at which point PoP mining will return to normal. You can see the current state of Bitcoin testnet block times here: https://www.blocktrail.com/tBTC. This condition will not be an issue when VeriBlock uses Bitcoin mainnet in the future. Q: Should I continue to PoP mine? A: You can continue to PoP mine, but be aware that some PoP transactions may not succeed or earn a payout due to the incredibly fast tBTC blocktime. PoP payouts are related to "timeliness" of inclusion in the tBTC blockchain based on the height your PoP transaction was included in, and until tBTC self-heals from the bug, it's likely that PoP transactions from different users will be spread out over many tBTC blocks. Q: Why won't this happen in BTC mainnet? A: Unlike BTC testnet, BTC mainnet does not have this bug. VeriBlock actually has a testnet irony for the Mining Sunrise. Normally "test" is low volume compared to "main". However our testnet actually experiences far higher load than mainnet. 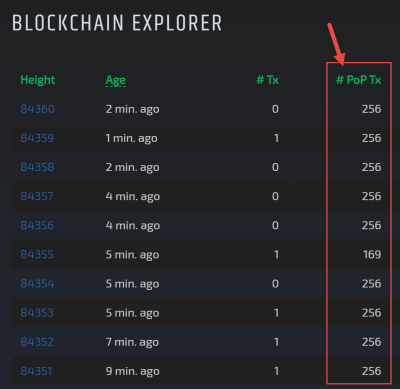 Because tBTC is free, and anyone can max out the full amount of PoP transactions, the load on testnet is brutal compared to what is expected on mainnet (similar to how if PoW mining was free to do!). This load could be 10x larger on testnet than will be expected on mainnet. This means more disk space, more network load, and more processing time to sync. If a large group of miners start mining, then the blocks will come much much quicker. If they stop mining then the difficulty will eventually re-adjust, but people tend to notice when blocks come quickly (load is demanding), not when blocks are slow (and everything keeps up). This can happen on both the VeriBlock testnet network as well as the testnet Bitcoin network (or both, simultaneously). VeriBlock connects to BTC, and is therefore affected by the BTC blockchain. VBK TestNet connects to BTC TestNet. BTC TestNet had a known difficulty bug that happens every other month or so (https://wiki.veriblock.org/index.php?title=Community_Announcements#Bitcoin_TestNet_Difficulty_Bomb). When this does happen, blocks could come at 100x the normal rate. This greatly increases the load on VBK TestNet, as it is required to track, process, and store 100x the number of headers per minute than expected. This page was last edited on 14 August 2018, at 15:59.